Sweetheart A-line lace gown by James Clifford. 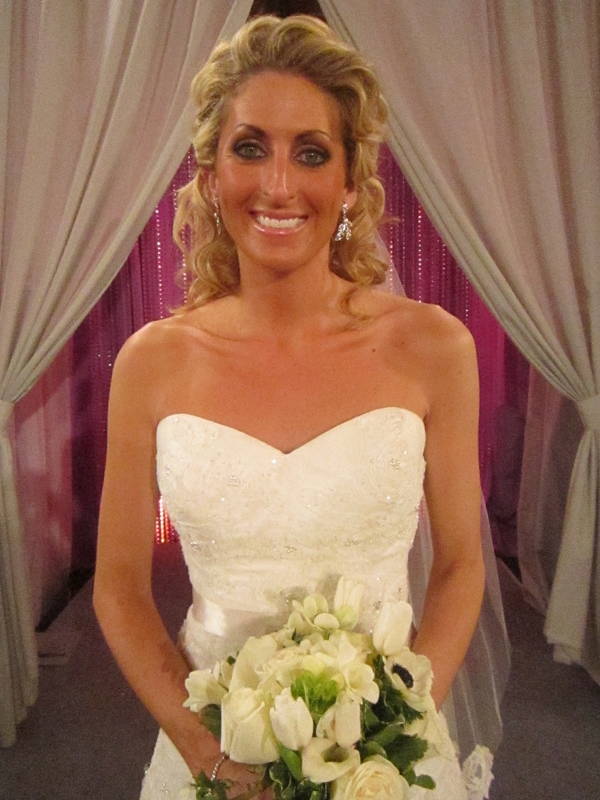 After losing her mother to cancer nine months earlier, Nicole wasn’t able to even think of shopping for a wedding dress without her. Nicole arrived at my pop-up salon in Chicago hoping that I could help make the experience special despite her mom not being there. Following her cue that she wanted to look soft, ethereal, and romantic on her wedding day I began bringing dresses for Nicole to try. In the dressing room, she loved them all, however, once she began trying them on, none of them wowed her. Changing gears, I chose a new silhouette I felt would compliment Nicole’s figure beautifully and also meet the romantic feel that Nicole was looking for. As soon as Nicole slipped on this sweetheart A-line gown by James Clifford, she felt like a bride. And realizing that this was a gown her mother would have loved to see her in, an emotional Nicole said, “yes” to the dress. 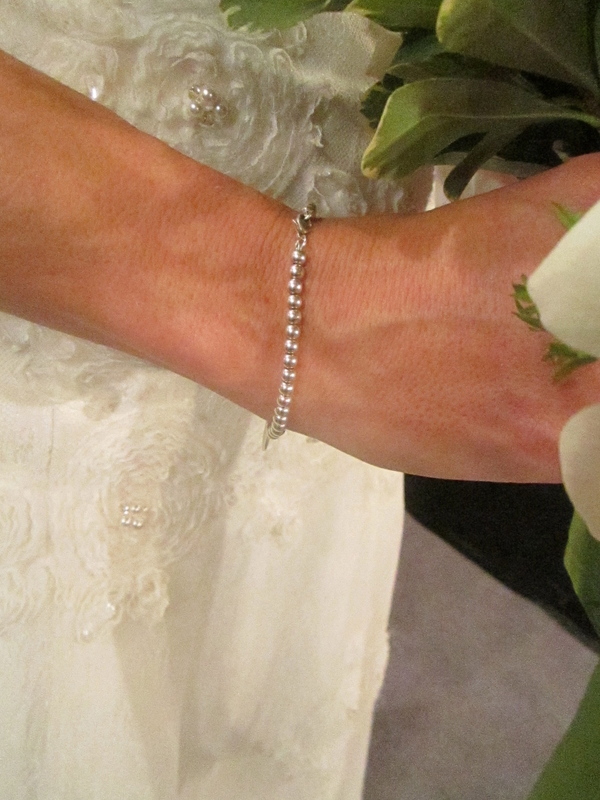 To incorporate her mom’s memory in Nicole’s final look, I created a hand-lettered sash for the bouquet that quoted their special “I love you the most” declaration in Swarovski crystals. I chose a floor length veil (Emma) from Nilah & Company secured with a crystal headpiece from Malis Henderson to add sparkle. Keeping Nicole’s cheeks and lips soft and natural with pink tones, Raychel played up Nicole’s large beautiful eyes. Lindsey used the natural curl in Nicole’s hair creating a beautiful cascade down her back. 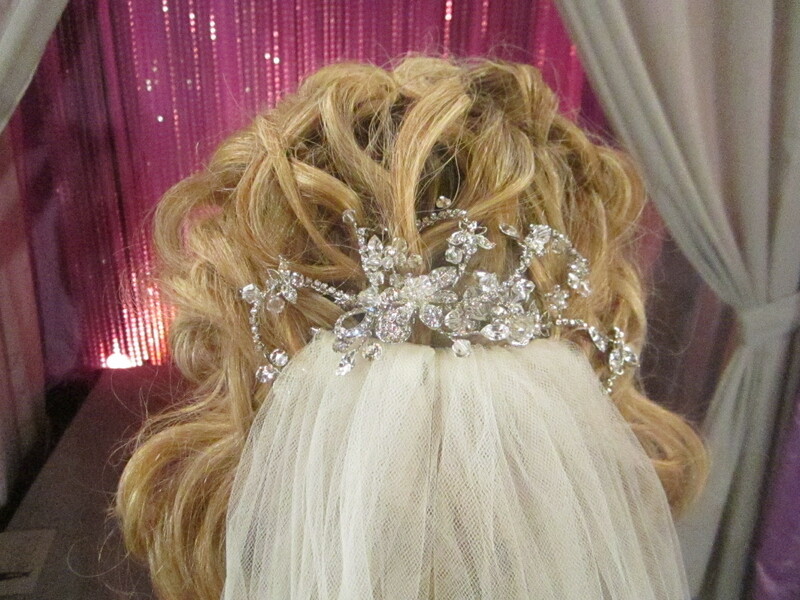 Detail of headpiece from Malis Henderson. Delicate crystal and pearl earrings by Thomas Knoell. 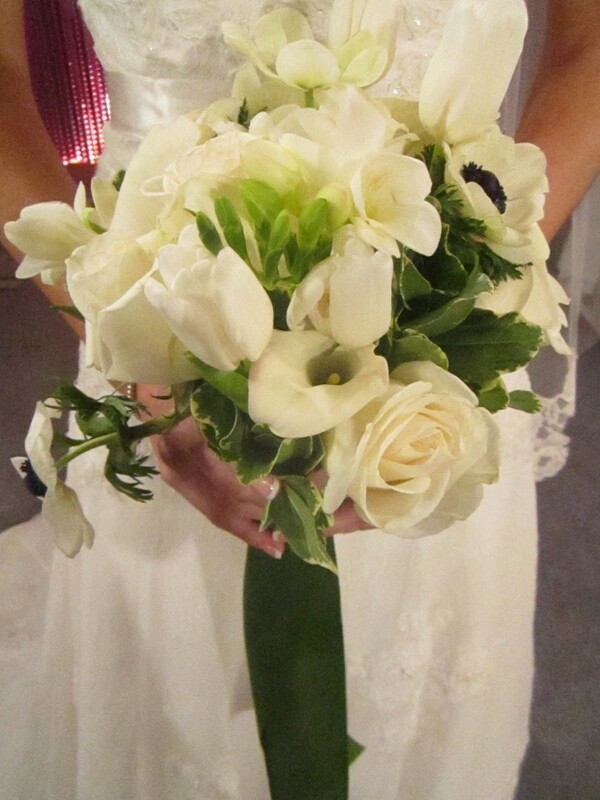 An elegant bouquet in white and green colors. 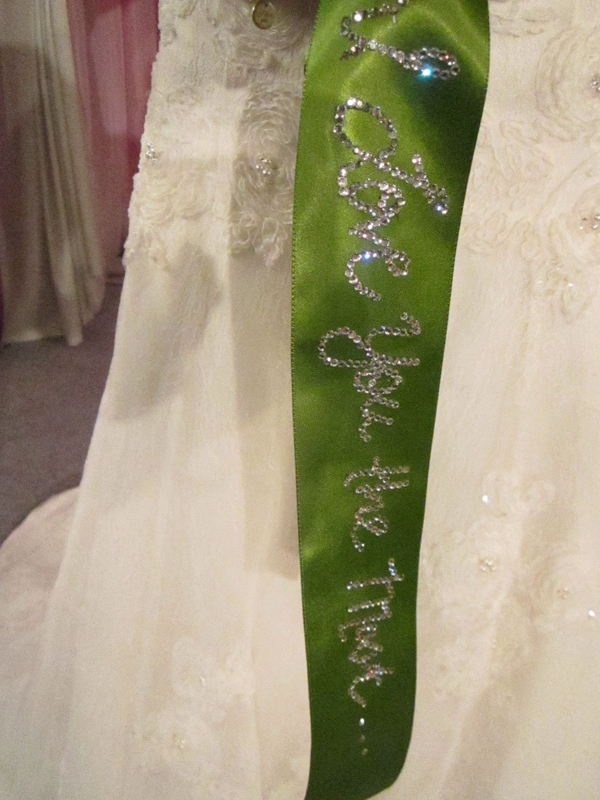 “I Love You The Most” ribbon detailing. Remember to include personal elements into your look. 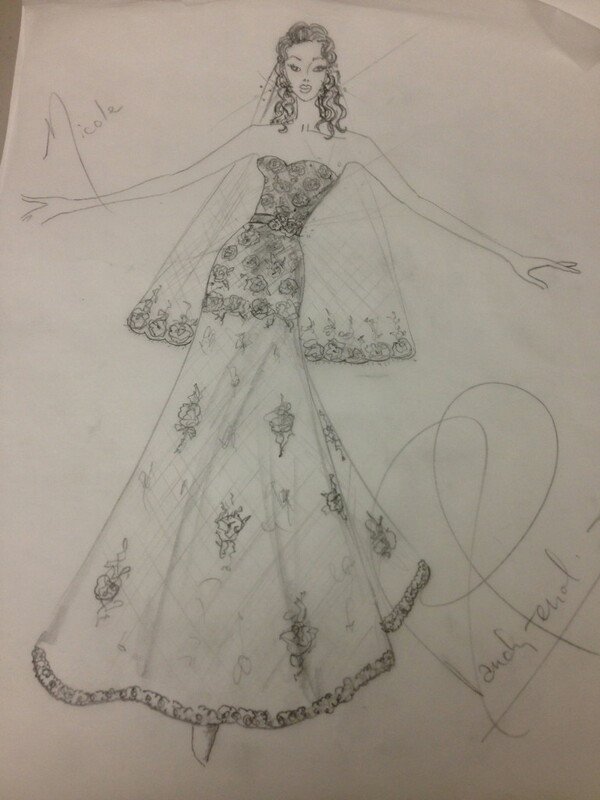 My final sketch for Nicole’s romantic Bridal Blueprint. Go to www.jamescliffordcollection.com to see more gowns from James Clifford. Nilah and Company accessories and veils can be found at www.nilahandcompany.com. Jewelry and accessories from Thomas Knoell can be seen at www.thomasknoell.com.